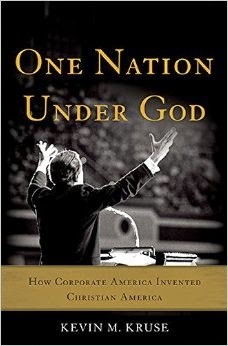 One Nation Under God, Kevin Kruse’s new book on How Corporate America Invented Christian America, is a fascinating narrative of the connections between religion, big business, and patriotism and governance in the United States from the New Deal to Ronald Reagan. The book is justly receiving praise and widespread attention, including several reviews here at Religion in American History (by Michael Graziano and Darren Grem) and coverage in the New York Times and on NPR. Since there are a number of reviews or summaries of the book available, I am going to take for granted that you know the basic shape of the book. In this review I intend to cast the book’s argument into relief from the perspective of nineteenth-century American religious history in order to highlight the contribution that the book makes. One Nation Under God is a history of how the idea that the United States is a Christian nation was deployed in the middle of the twentieth century. There were several possible historical moments when this idea could have arisen. One is during the revolutionary period: Kruse deftly “sets aside the question of whether the founders intended America to be a Christian nation and instead asks why so many contemporary Americans came to believe this country has been and always should be a Christian nation” (xiii). Another contender is the Cold War period. This book takes the Cold War into account, to be sure, but it offers an important corrective by tracing the idea of “one nation under God” to business opposition to the New Deal in 1930s and 1940s. As Kruse writes about the addition of that phrase to the pledge of allegiance, the change was “the result of nearly two decades of partisan fighting over domestic issues. The Cold War contrasts were largely a last-minute development, one that helped paper over partisan differences” (109). But there is a third contender for the origins of the Christian nation idea: the nineteenth-century United States. This critical period for understanding church-state concerns has been re-examined in recent years by scholars such as Sarah Barringer Gordon, Steven K. Green, and David Sehat. Yet there are many examples of how the rhetoric of Christian nationhood was deployed in the nineteenth-century United States, often in ways that were more coercive than a publicity campaign. I’ll mention just a few of the examples discussed in the work of Gordon, Green, and Sehat. One example is the well-known 1811 case in New York of People v. Ruggles, in which Justice James Kent sustained the conviction of a blasphemer on the grounds that “the people of this state, in common with the people of this country, profess the general doctrines of christianity” and to blaspheme thus struck at the “the root of moral obligation” and obedience to the state. The reform or benevolence movement which took off after the War of 1812 often had took its impetus from the idea that the nation needed to be Christianized. 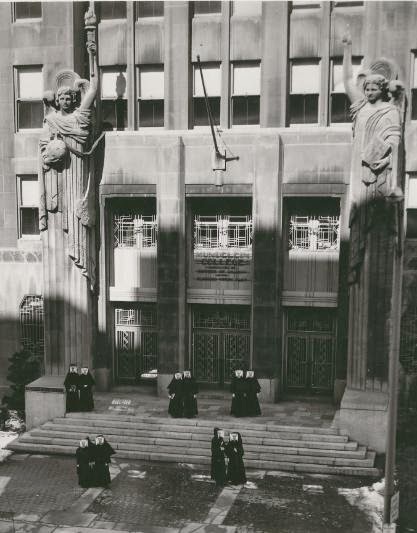 The American Tract Society and the American Bible Society, for example, were both very large corporations (maybe even the biggest of their era) formed by interdenominational alliances with connections to high-ranking politicians who put out intensive publicity efforts. The sabbath mails controversy which periodically raged in the antebellum era seems to me to be not unlike attempts to introduce god-language to the pledge or the currency. Kent’s idea in Ruggles was closely related to the legal maxim that Christianity was part of the common law. Steven Green has charted how this maxim was undercut in what he calls The Second Disestablishment as the law in the nineteenth-century was given a firm secular basis. But at the same time Christian justifications for the law were being removed, the idea that Christianity was the basis of the political and moral order received a new lease on life in the second half of the nineteenth century. The Civil War led to a great deal of anxiety about the basis of government and a widespread sense that it was a failure to adequately recognize the Christian nature of the political order that had led to the war. After the war there were a number of attempts to write Christianity into the Constitution, mostly notably by the National Reform Association (the other NRA, as my students dubbed it). Reading the publications of the NRA, I’m struck by how similar some of their arguments are to those made by the actors in One Nation Under God. As Sarah Barringer Gordon has shown, anti-Mormon, anti-polygamist arguments relied at least in part on the idea that Mormonism and polygamy undermined the Christian family and thus the state. The writings of Walter Rauschenbusch, to cite him as one example of the social gospel in the Progressive era, relied on a reading of the Old Testament prophets which presupposed a connection between Christianity and the social and political order. I enumerate all these examples from outside the scope of Kruse’s book to make two points. First, I’m not persuaded that this book uncovers the origins or invention of the idea that the United States was a nation under the (Protestant) God. There are just too many examples of that discourse which were mustered to do real political and social work prior to the 1930s. If someone wanted to pin me down to an origin date for the Christian nation idea, I’d argue for the late 1810s and early 1820s, with significant resurgences of the idea around the Civil War and during the 1880s and 1890s. Crucially, though, there was a gap in the early twentieth century. So Kruse is right in that the movement he tracks from the 1930s was a re-discovery or reinvention of this idea—a reinvention, I suspect, which owed at least some of its success to the ways in which the trope had been used before. But my second, larger point is to use these nineteenth-century examples to highlight the signal contribution that One Nation Under God makes. What this book accomplishes is to show us how the idea of a nation under God became fused with libertarian ideas instead of ideas of moral or progressive reform. All of the examples from the nineteenth-century above yoke the Christian republic tradition to the exercise of state power: against blasphemers and drunkards, against Mormon polygamists, against slavery, against poverty and social inequality. This historical explanation of how people connected Christianity and the state has always made good historical sense to me. But if you had asked me before reading this book to explain how conservative white American Christianity came to be associated with libertarianism, I would have ventured a few unsatisfactory suggestions then thrown up my hands at the unsolved historical puzzle.1 Kruse’s book shows how those two became connected and, in meticulous detail, how that connection was spread by means of corporate influence over media, advertising, and politics. The book also shows the limits of this connection. “Only the broad concept of ‘one nation under God’ proved elastic enough” to bring conservatives and liberals together but it did so at the cost of vagueness (108). As the final section of the book shows, the Christian nation concept was constantly challenged for attempting to be comprehensive of religions or people who did not want to fit under the totem of “one nation under God” or for being excessively vague about which god that phrase referred to. In other words, Kruse has explained the origins of the most recent configuration of the Christian nation idea—a connection between the Christian nation idea and libertarianism that is all the more important to understand at a time when the central symbol of church-state conflict is Hobby Lobby. I missed the chance to teach this book in both a class on church and state last semester and a class on religion and capitalism this semester. But when those classes roll around again, One Nation Under God is sure to be on both syllabi. p.s. I'd love to see your syllabi for those courses. I'm trying to devise a course on religion and politics in the Modern "West" (19th and 20th c., putting European thinkers and debates in conversation with American ones, maybe introducing thoughts about challenges faced by Muslim communities in the West at the end), but I'm pretty weak on the American side of things. Bingo! THANK YOU for offering the perspective of the 19th century, which gives a much wider perspective than Kruse offers. I think your review nicely balances the 19th century corrective with the recognition that there were innovative developments in the post-World War II setting. And, if people wanted to read even farther back into discussions about Christianity and the State, I think there's a new book out about "Federalist Politics and Religious Struggle in the New Nation." ;-) Mentioning Chancellor Kent forces me to point out that he was a Federalist and a good friend of John Jay. Steven Green's forthcoming book, Inventing a Christian America (Oxford, July 2015), should be a nice conversation piece with Kruse's work. A different angle on the origin of US identity indeed, but as a "bookender" to this book, I offer "One Nation Under Gods." Note that "s" at the end. Jonathan, Kristi, and Gadfly: Thanks for the additional suggestions. Joe: I think you are correct that there are (or at least were) competing discourses about what a "Christian nation" might mean. Certainly, the fusion of the political right with the Christian nation idea is not thoroughly consistent on libertarianism. That is, it might favor hands-off on the economy but a strong protection for traditional morality. But the heirs of the mainline Protestant traditions now seem thoroughly pluralist, which undercuts any notion that Christianity is uniquely foundational to American politics. By the way, all my syllabi are available here. Oh, to your idea of competing ideas of Christianness, Joe: I'm not entirely sure where the Protestant Christian left written about by David Swartz in Moral Minority or the Catholic left of Dorothy Day and the Catholic Worker fit in here. I'd have to think more about that.